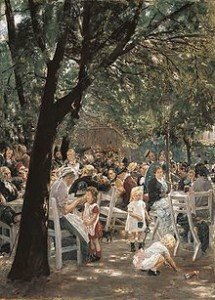 As soon as the temperature creeps up a bit, Germans are obsessed with eating outdoors. These last years beer gardens have been joined by beach bars (Strandbar) on urban river stretches, urban parks with designated areas for BYO barbecues (Grillzone), as well as the revival of the good old Balkonien, the home balcony. Modern culinary influences are present everywhere: Pizza ovens cater for the beach loungers, Turkish lamb kebab smoulder on barbecues, and Germans enjoy their favorite summer dish, Mozzarella cheese and tomatoes. Bavarian beer gardens have their own rules and customs. You sit on long wooden benches, mostly under large horse chestnut trees which were originally planted to cool the underlying beer cellars. Various food is for sale, on the traditional side from refreshing salted white radish (Radi or Rettich in high German) cut in long spirals to very hearty fair like grilled Haxn (pork shanks) and Grillhendl (grilled chicken). Real foodies bring their own picnic hampers and just purchase drinks at the Schänke or bar. A real beer garden serves more or less everything in a one liter Masskrug – except Weizen, the generally cloudy wheat beer for which half liter glasses are traditionally used. One of the most historic beergardens is right next to the old brewery of Weihenstephan, founded as a Benedictine monastery in 725, in Freising/Bavaria. Monks have always been very good at beer brewing! Legend has it that half a century ago the landlord’s wife here came up with the recipe for Obazda, a spread made from white rind cheese, butter and fresh cheese, seasoned with onions, paprika and caraway seeds. It is usually served with pretzel sticks and definitely worth a try. In a bowl mix the cheeses with the beer and the paprika powder, using either your hands (very messy, but makes for a good result) or a handheld mixer. Obazda should be creamy but still have small recognizable cheese bits. Taste and then decide how much salt and pepper you need – it should further your thirst but still be pleasant. 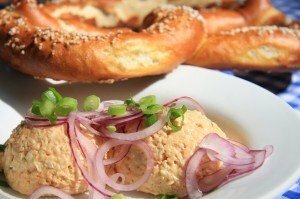 Serve in a bowl covered with fresh onion rings, dipping in with the pretzel sticks. Prost!